Enterprise Resource Planning (ERP) is a mission-critical application that is essential for end-to-end support of an organization. It provides visibility to decision-makers, helps to promote efficiency and collaboration, and provides a complete system of record. 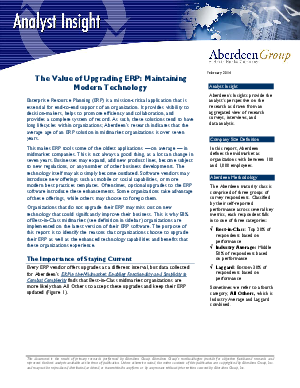 Download this report to learn why organizations choose to upgrade their ERP as well as the enhanced technology capabilities and benefits that these organizations experience.